Our brackets are made to professional standards. Each bracket is made 100% in house from design to CNC cutting and TIG welded in a fixture using a 6 axis welding robot. What this means for you is repeatability. Each bracket that comes from us is guaranteed square and precise. Hole spacing is perfect every time. Which makes things EASY. 24" Brackets are CNC cut with perfect spacing and precision accuracy. Made with 3/16" steel back plate and 3/4" diameter solid steel support rods. The brackets have pre-drilled mounting screw holes for 16" stud spacing. Solid steel construction means these are ultra heavy duty. 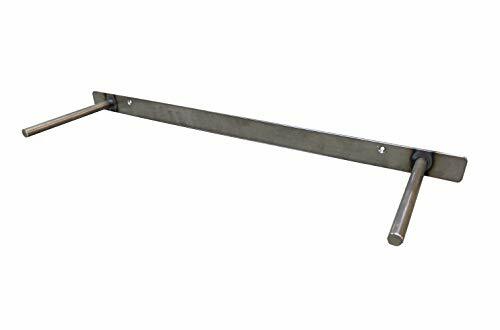 The support rods are 6 1/4" long making the minimum shelf depth 6 1/2"
These brackets will support shelves from 6 1/2"-14" deep. You can easily add more mounting holes if needed with a 3/16" drill bit. We HIGHLY RECOMMEND mounting the bracket into the studs. Our brackets are stack-able, use multiples in series to support longer shelves. See our other listings for 12" and 32" brackets! If you have any questions about this product by Walnut Wood Works, contact us by completing and submitting the form below. If you are looking for a specif part number, please include it with your message.